Product #1256 | SKU C21-9971 | 0.0 (no ratings yet) Thanks for your rating! Official Authorised Canon NZ dealer - No Parallel imports! 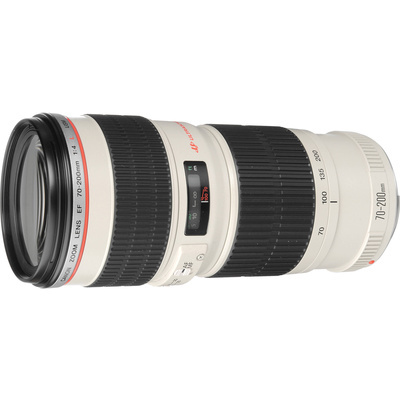 A flexible zoom distinguished by its relatively lightweight and compact design, the EF 70-200mm f/4L USM is a Canon L-series optic spanning a useful portrait-length to medium telephoto range. The constant f/4 maximum aperture allows you to maintain a consistent exposure throughout the zoom range and also contributes to the sleeker form factor when compared to other 70-200 mm lenses. In regard to its optical performance, this lens employs one fluorite element and two ultra-low dispersion elements, which work in concert to suppress chromatic aberrations and colour fringing for notable clarity and colour accuracy. A Super Spectra coating has also been applied to control flare and ghosting for improved contrast when working in harsh lighting. Complementing the optical attributes, this lens also features a ring-type USM and internal focusing mechanism for quick, quiet, and accurate autofocus performance, as well as full-time manual focus override. One fluorite element and two ultra-low dispersion glass elements noticeably reduce colour fringing and chromatic aberrations for high clarity and colour fidelity. Focus Limiter switch lets you constrain the focusing to two different ranges to suit different applications: 1.2 m-infinity or 3 m-infinity.